The mainstream American media was just one big, almost unbelievable fail this past week. Between the Boston Marathon bombing and the subsequent hunt for brothers Dzhokhar and Tamerlan Tsarnaev, the ricin letters to Mississippi GOP politicians and President Obama and the fertilizer plant explosion in West, Texas. In the last case, the one that killed and injured more people than two dumb asses in Boston. Yet, somehow, in a world in which the best answer should be “I don’t know” or “We don’t know yet,” media folks and their experts have been tweeting and reporting at the level of gossip for the past five or six days. Usually a fairly careful journalist/columnist, Jonathan Capehart of The Washington Post tweeting three hours after the Boston Marathon bombing on April 15, “April 19: Anniversary of storming of Branch Davidian compound & the Okla. City bombing.” At that point, we didn’t even know the number of people killed, maimed or injured. Nor did we know the number of bombs that had exploded in Copley Square. Think, man, think! The more famous comments of the week came out of CNN’s shop, though. John King had breaking news Wednesday afternoon that law enforcement officials had identified a “dark-skinned male” suspect. Being a White guy working in mainstream media means that you never have to say “I’m sorry,” apparently. Especially when all of his “breaking news” reporting turned out to be completely wrong. Let’s not really analyze the so-called reporting of FOX News or the New York Post. You’d get more truth from a psychic doing a Vulcan mind-meld with Tamerlan Tsarnaev’s brain right now than you could from Murdoch’s news media world in a year. Let’s also not forget many of the so-called terrorism experts whom guessed wrong about race, immigrant status and so many other details this past week. Not to mention reports whom apparently couldn’t find Chechnya on a map if the republic were blown up to 100x normal map size and they put a floodlight on it. On this last one, I must put on my academic historian hat. As in — are you kidding me? Anyone ever hear of Boston in the years before and during the American Revolution? Or, in more recent times, the Oklahoma City bombing in ’95, 9/11 and Lower Manhattan, the DC sniper rampage in ’02? Or, if the idea here is that terrorism should only be viewed through the prism of those who feel terrorized, what about poor Blacks on the South Side of Chicago, in SE Washington, DC, or poor Latinos in cities like Albuquerque and Phoenix? Or, for that matter, innocent civilians in Yemen and Pakistan attempting to avoid being among the “collateral damage” caused by our drone wars for terrorist scalps? And then, there was the need for release, for yelps of relief and cheers of joy over the successful capture of Dzhokhar Tsarneav late Friday evening, with chants of “USA! USA! USA!” included. Of course people should feel relief for the end of a tense situation. But let’s not get carried away with the tide here. Stereotype quote taken from Annie Murphy Paul article (May 1998) in Psychology Today, January 16, 2011. (http://nwso.net/). In public domain. We know nothing of motive, but we do know that the police will return to its regularly scheduled racial and socioeconomic profiling in the coming days. 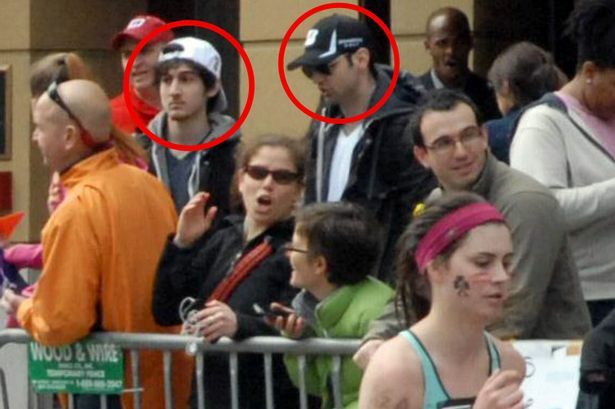 We can’t wrap our collective heads around the idea that two assimilated White American immigrants decided to kill runners at the Boston Marathon. Yet we also somehow decided to culturally and legally un-Americanize them — something we didn’t do with Timothy McVeigh. Chants patriotic might be a way to show solidarity, but we refuse to come to grips with the racial/xenophobic and anti-Muslim psychology that comes with these impromptu outbreaks of so-called unity. Don Henley’s “Dirty Laundry” remains just as relevant now as his tune about the American news media was three decades ago. Still, the completely centrist and biased, always-concerned-about-the-bottom-line media is a mere reflection of our narcissistic and imperialistic selves.